Today we'll make the first HaT review, the mini box 6007 Franks. The first thing you notice is how tiny the box is, which is quite nice, in this world of oversized boxes which try to make you think you are buying a lot and you find the box half-empty. Here all the space is used. The artwork itself is not outstanding, but it depicts more or less one of the figures you get. I always prefer box art with action and where all figures are shown instead of seeing just one, but it has the advantage that it is easily recognizable. These are typical HaT poses, a bit flat and unexpressive. It is not the worst example of them, but they don't give a lifelike impression. The man lifting his sword is hiding his arm behind his cloak in a so unnatural way it seems he has no arm at all, at least if compared to the other figures. The man with the spear can be converted to throw a francisca axe, which is a quite welcome option to get more diversity, although if you leave him with the spear it also has a quite unnatural pose. This mini-box set is very limited in poses, you just get 4 poses and 24 figures. This really is half a normal Hat set. With only four poses, you can't get many things wrong, and thanks to god they are absolutely right and correct here. The spike of the shield wouldn't be a very common feature, and not all Franks would use it, but it is not really wrong. 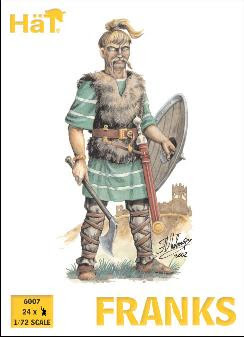 The typical Frank hairstyle identifies them as such, but there were other germanic tribes that used the same or very similar hairstyles, such as the Alamanni or the Thuringians. With a very slight modification, that is cutting their hairstyles, and maybe trimming off the central spike of the shields, they could be used for nearly all germanic armies from the 3rd century to the 9th century, giving them huge possible uses. Too few poses, all of them very unlifelike, makes the funness of this set very limited. 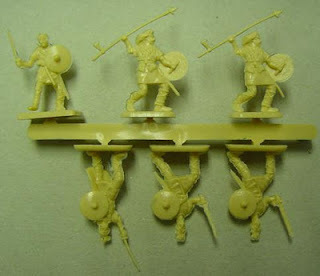 At the moment of their release it was quite impressive to see someone such as the Franks having a set, but in our days you don't see them as being so strange or unique, as we now have a quite big range of more obscure armies with much better representations. They will need a good deal of modifying to make them interesting and fun. 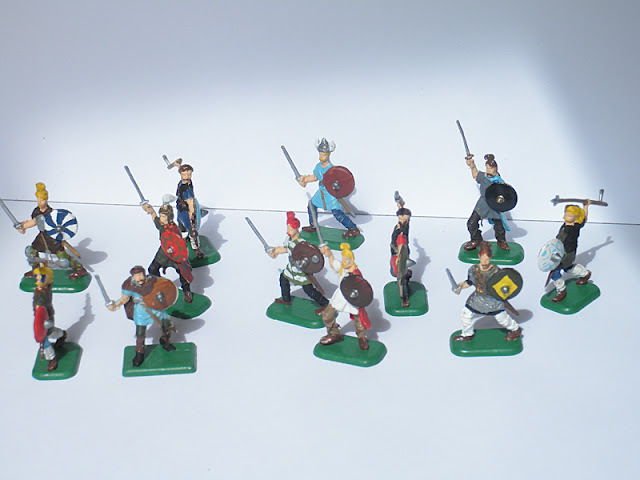 24 figures isn't much good when wargaming (of course it would vary with the rules, but speaking generally not) and much less if you have just four poses, three of them swordsmen, all with the same shields and armour. You don't have archers, nor a leader, nor berserkers, etc. Just a spearmen-axemen, two regular swordsmen and a swordsmen that could be transformed into a leader or captain. You will have to buy two sets to first have enough quantity, and then you would have to combine them with other sets like the Esci Barbarian Warriors to have some other necessary poses. The main reason behind the mini-box sets was the price. Originally at retail they were around 3 € to 4 €, and even some years ago this was very cheap. Actually, it seems that now they are a bit scarce, and hard to find. Paying 6 GBP for them I would judge is outrageous, considering what you get. Add the shipping and it is quite intolerable, knowing you can get 42 Caesar figures shipped for 8 GBP normally. So it depends if you can still get them at retail stores or not. 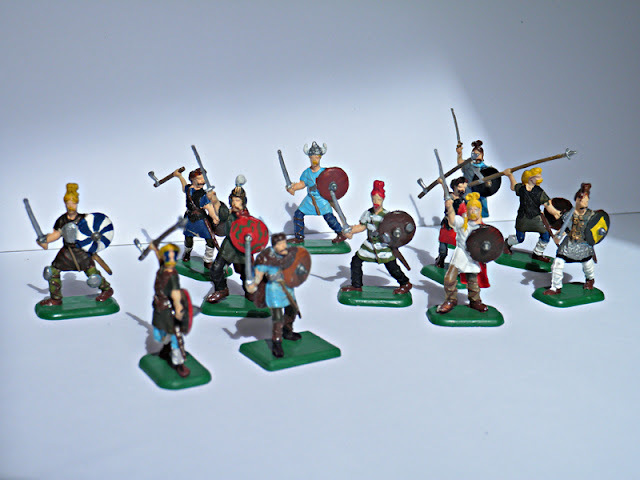 All the same, there is a limited selection for germanic/barbarian armies, so if you want to represent just the most important factions, you will have to buy nearly everything that's on the market. This ratio goes the same for all early HaT sets, very bad to glue, a bit better to paint. Leaving aside in this case the controversial case of the price, I would give them a 7. 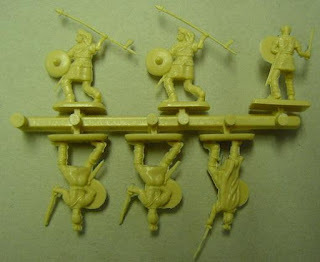 They are not very impressive, but they are a nice addition, and you need someone to make the Roman Empire fall! They can also be used for later Frank armies, till the 8th-9th century. The price here is very important, I bought them basically because they were cheap at that moment. These figures have been painted and modified by myself. I have given them some helmets and armour to differentiate them a bit between themselves.